Pictures: Took this shot back in 05 while I was still living in a stick and brick. 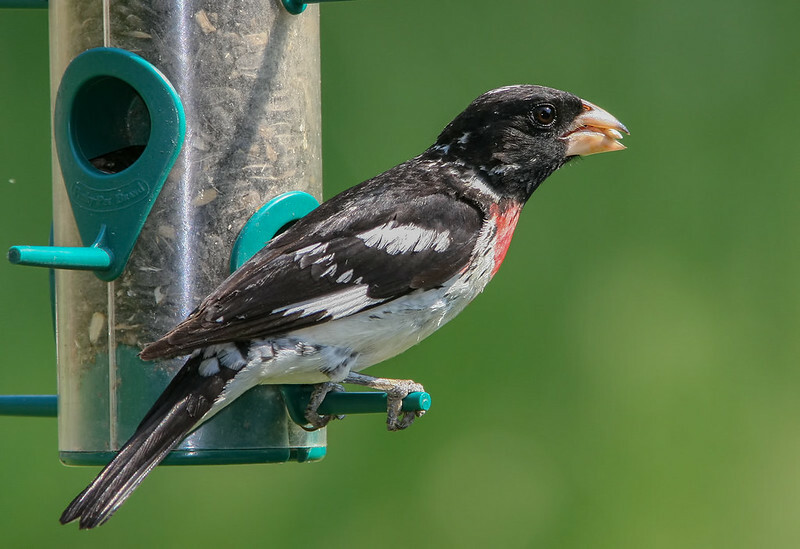 Rose-Breasted Grosbeak, enjoying my seeds. Cooler: It is a pretty day out today and the good thing is that the wind is not blowing much. Yesterday was madding windy! WordPress/Google: I use the Noscript extension in Firefox and when I log into WordPress.com I usually have to allow WordPress.com and wp.com and I am good to go to do all the things I need to do on the blog. Over the last few days I have notice that I have to allow google.com and google-analytics.com in order for everything to work (Tags, proof reader and the tool bar just above the text box). I really don’t like allowing google anything pass my Noscript extension. If this continues I will stop using tags and find another way to proof read my text, its not like I am all that good at this writing thing anyways! I will miss the handy tool bar. I do understand that this interconnection is what allows google search to find my blog and things in my post on the blog, however if I was worry about all that I would just use google blogger. I think I am one of these folks that would like to see big tech companies (like Google) broke apart.